Here's a few projects I've done or have in the works so far. Good, but lots to learn! I scored a "Very good" on my mead at 2015's Texas Mead Festival Amateur competition. This entry was my traditional dry mead. I do have two other semi sweet meads, one of which with elderflower. The name "Skarðaborg" on the bottle is how my family originally spelled our name after converting from the patronymic naming convention for surnames in the 11th century AD. I currently have a sweet/ sack Texas wildflower on as well as a sweet organic berry with Texas wildflower honey, blueberry, blackberry, and strawberry....and I have a lot yet to learn. Drinking my homework has been fun for all. Skál! Students learn to make dishes with real traditional Japanese style and aesthetic that are next to impossible to find on menus in Houston today. Not common on American menus, sadly. Tsukuda-ni is a regional specialty originally from Tsukuda Japan. 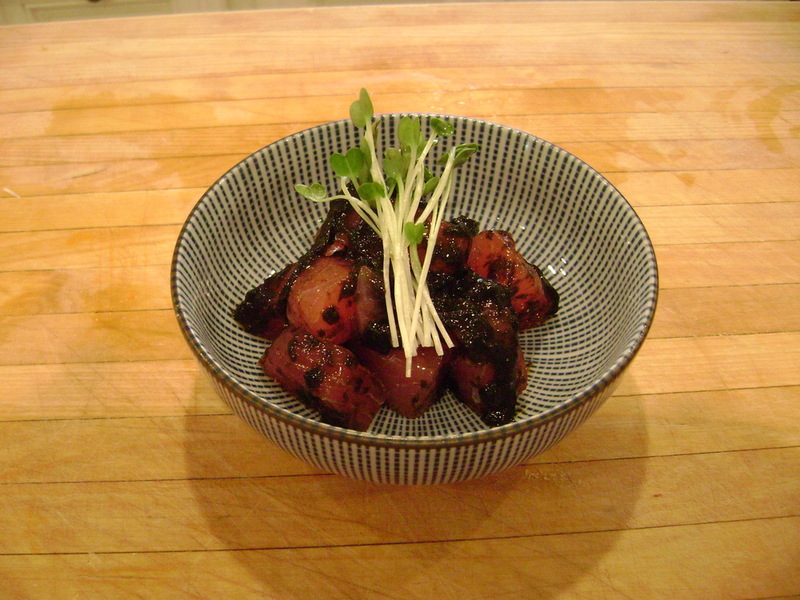 Vegetables are slowly simmered over time, and this particular one features nori and pepper. It's a bit sweet and salty like western style fruit preserves and a bit spicy done in the Kansai style, and works very well served with tuna. One of my solid favorites to make, but hard to imagine the luxurious complex flavors unless you've tried it. This was my first year to make Icelandic/ Scandinavian foods for the traditional time of year. There's alder smoked Norwegian salmon and mackerel, lyfrarpylsa, flatbrauð, graflax, and blood sausages. I lamented not having hákarl to serve, but apart from the Reyka and Brennivin I did have my own home infused dill and caraway schnapps. Next year these plus, sviðsulta and hrútspungar. Skál i botn! Advanced students got to do live fish cutting. You must be confident and work fast to pull this dish off properly. We served this one with a light smoky style of shoyu with katsuobushi. This one is very nice with an Italian Prosecco.